Upon entering the Bnai Yeshurun Beis Medrash at night, one is struck by the Kol Torah. On a typical weekday night there are twenty to thirty people learning diligently with their chavrusas. This is due to the newly established Yeshiva University Bnai Yeshurun Beis Medrash which began this past September, created through the partnership of Yeshiva University and Congregation Bnai Yeshurun. Four nights a week, ten rabbinical students from YU’s Rabbi Isaac Elchanan Theological Seminary (RIETS) travel to the Teaneck synagogue to learn with synagogue members, strengthening the community’s already strong commitment to Torah study. The students and community members study a broad array of Torah topics, including Chumash, Gemara, Halacha and Jewish thought, determined by the community member’s area of interest. The new Beis Medrash program is an exciting example of Yeshiva University and its Center for the Jewish Future’s commitment to working with visionary communities across North America. The program was initiated through the significant efforts of Bergen County Beis Medrash founders Jackie Feigenbaum and Henry Orlinsky as well as Danny Sacks. Working in tandem with CJF Dean Rabbi Kenneth Brander, Congregation Bnai Yeshurun’s Rabbi Steven Pruzansky, assistant Rabbi Ari Zahtz, and Rabbi Elie Mischel, Assistant Director of Community Initiatives at the CJF, they recruited passionate students from RIETS while promoting the idea throughout the community. Rabbi Netanel Wiederblank, a popular Rebbe in Yeshiva University and RIETS who has also served as a scholar-in-residence in communities across North America, leads the Beis Medrash Program in his capacity as Rosh Beis Medrash. Rabbi Wiederblank’s kind character and in depth knowledge of Halacha and Hashkafah distinguishes him as one of the rising Torah scholars in the YU community today. In his capacity as Rosh Beis Medrash, he has offered his leadership to the program, directing the RIETS students and answering questions that arise during the chavrusas. Rabbi Wiederblank also shares his breadth of knowledge of Jewish philosophy with a weekly class entitled Digging Deeper: Exploring the Philosophical Foundations of Judaism, every Tuesday evening at 9:15pm. The shiur investigates important questions in Jewish thought, including the notions of free will, Moshiach, suffering, and chosenness. The Beis Medrash Program’s inaugural event highlighted Rabbi Dr. Jacob. J. Schacter, Senior Scholar of the CJF and University Professor of Jewish History and Jewish Thought, who delivered a pre-selichos shiur on the topic of Selichot, Teshuva and Tefillah: Preparing for the Yamim Noraim. Rabbi Dr. Schacter stressed the importance of beginning a new year with daily Torah learning, which the Beis Medrash Program was designed to facilitate. The community has already demonstrated its excitement for the new program. 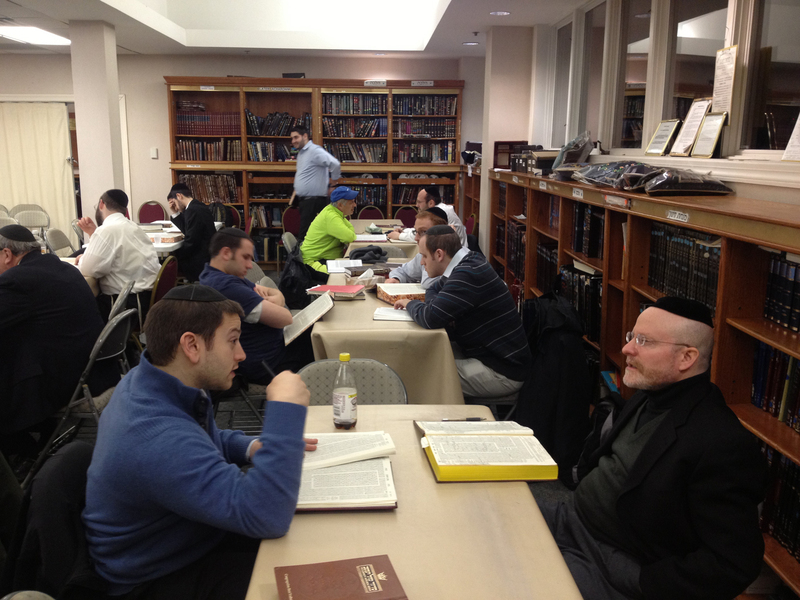 In the few months since the program began, the community has responded enthusiastically to the Beis Medrash Program, with over fifty weekly chavrusa slots already filled. And at the Yeshiva University Bnai Yeshurun Beis Medrash Shabbaton at Bnai Yeshurun on December 1st, community members joined together with the Beis Medrash fellows at a community tisch and attended several shiurim presented by fellows and Rabbi Wiederblank. At its core, the Yeshiva University Bnai Yeshurun Beis Medrash showcases the extraordinary dedication of community members, who take time out of their busy schedules to learn Torah, as well as the excitement and knowledge of RIETS students. The Center for the Jewish Future takes great pride in spreading the warmth of Yeshiva University to local communities. Together with Congregation Bnai Yeshurun, we invite community members to join us in Torah study bechavrusa – fulfilling Le’hagdil Torah U’lehadira. Gershon Albert is a third year RIETS student as well as Rabbinic Intern at the Center for the Jewish Future.